Today we had predicted good day ahead of us. We all knew this will be a longer, nice, but still even colder day. They measured -20°c 100 km south of the competition area. But, who cares about cold, we dress up, our harnesses provide first cloth, the only thing that is suffering in this temperatures is hands. I tried to fly paragliders in this kind of temperatures and believe me, we hg pilots have much easier job dealing with it than them because of position of our hands (downwards). Organizers called a 91 km task, a traditional one, a task with really only vision obstacles like valley crossings, ... Easy one. We took off straight to freezing 2000 m again, with 30 minutes to spare just up there. Fingers shaking, hand shaking, you try most you can to stay warm, but still don`t go down to warm up. I started up good and was in front until Nanos antenna. 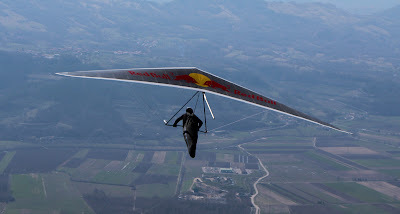 We where flying back where you had to decide where to go, Vipava valley makes a small curve with the ridge, so you could pass it on the flats or go with the ridge. Clouds seemed good, half the way but really bad in the crucial part. I decided to go traditional way, but left the climb to early where we where together with Iztok. I lost too much yesterday to be observing the competition from behind, so I went for it, low, too low to the ridge straight in to the W wind. While I struggled in the lee sides of the ridge Iztok overflew me big time and in the end won the day. Guys who flew in the flats mostly made it, only Primoz choose a landing quite close to mine as he rushed too much like I did, only another way. I can not be satisfied with the flying here, but I know the mistakes I have done where all lack of patience one. Bassano in 14 days, if.... the weather will be ok. The winner was Christian Chiech who is always flying from behind to the front, second was Iztok who took all the chances of this competition to fly more conservative and in the end, ended up with a great result! 3rd was Franc Peternel who is really steady in the last years, great guy for motivation! Congrats to all. 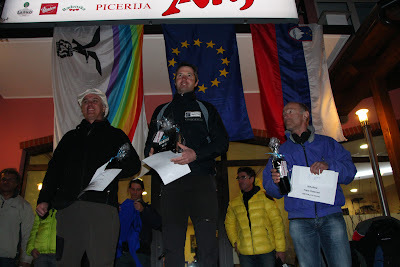 Winter race was a winter race, cold, strong, well, yes short for two days but still, very nice. I hope that pilots went home from Slovenia with a smile on their face ones again.